Welcome to Higher Ed Blogs. This blog site is used primarily for workshops explaining how blogs are being used in higher education. This blog is maintained by Barry Dahl. Anyone can use the contents of this blog as they please. Any suggestions for additions to the site are welcome. Please leave a comment or send me an email. Weblog: A blog is a website where entries are made in journal style and displayed in a reverse chronological order. Many professors have started having their students use blogs to publish their writings or other creations on the net. There are many examples of writing instructors who are using blogs as an alternative to students turning in papers to the instructor. I disagree with the general sentiment of this quote. (BTW, I don’t think she’s the first one to have said this, she’s just one that I could find saying it for the quotation.) 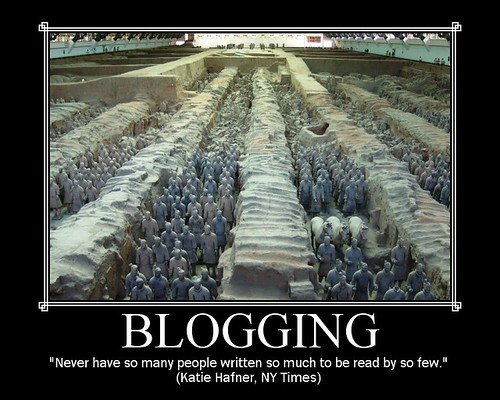 Sure, there’s lots of blogs that don’t have a wide readership. Many times that’s intended or expected by the author. Still, having even 20 people read what you write is more than many people could otherwise expect. Think for a moment about the normal situation when students write a composition for a class. They hand in their papers to the instructor. Who reads them? Right, only the instructor. So, education is the arena where never have so many people written so much to be read by so few. Contrast the traditional approach with the idea of having students post their work to a blog. Not only can (and should) the other students in the class read their writing, but other people can read it as well, leave comments or critiques, and otherwise inspire the students to write better because they now have an audience. In addition to traditional writing courses (Freshman Composition, Creative Writing, etc. ), blogs are being used for many other disciplines as well. To see examples of various uses, go to the Blogs in Classroom page. There are several reasons why a college or university might want to host their own blog site rather than use a commercially-supported blog site. Examples of schools hosting their own blogs and factors to consider when doing so will be discussed and considered. For examples of this, go to the College Blogs page. Besides having students use them for class, there are many other ways that blogs can be used on campus. They can be used for campus clubs, in place of a campus e-mail newsletter, as a promotional tool, as a planning tool, even for campus committees (although a wiki might be better). For examples of this, go to the Other Uses page. Using Blogs as a Web Content Management tool. One great things about blogs is that they are very easy ways of getting your content online, oftentimes in lieu of a normal website. Due to the simple user interface, using a blog site can be a great way to display content on the web, especially for non-geeks. To see some examples, go to the Web Content page.